Listened to the Ron Smith tribute Thrillcast yesterday - and what a fantastic episode it is. What struck me was the talk of that photo of Ron Smith at a signing. Him all straight laced, shirt and tie looking very dapper. The other droids present looking all scruffy and post punk cool. The contrast is a joy to behold. Anyway it got me thinking that why Ron Smith's Dredd works so well. His Dredd is the straight edged Kirby inspired dynamic superhero. All clean cut and polished. His citizens and villains are the Wagner and Grants of this photo, all post punk, and lopsided and from a different time and dragged through the real world backwards. Its these two juxatposed that heightens the power and craziness of both. Just superb. I'm so glad Ron Smith wore a tie and had a neat mustache. Spot on Colin - couldn't agree more. I know the photo you mean, I'd like to see it again, any idea where can I can find it? There's a fine tradition of dapper moustaches among the top Dredd art droids. Thanks Eamonn - that's great! It's from the Forbidden Planet archives. I spent a whole year going through boxes of materials, then scanning in and restoring 12,000 images! Thanks, I'm going to head over there now! |I love that pic! 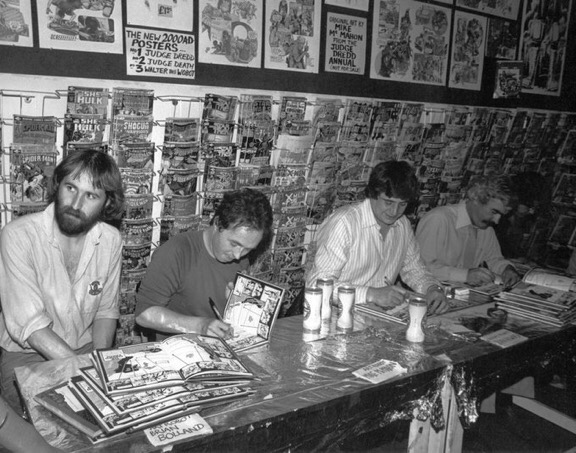 I remember when the 3 posters advertised behind them were the only 2000ad merchandise that existed - I dragged the family across London to visit that FP, which AFAIK was the first and only comic shop in the country - my dad didn't really believe there was a whole shop just for comics till we got there! I did get to visit the shop in maybe 1981-ish, and had enough pocket money to get a single back prog. It was like being in Aladdin's Cave. Ridiculous amount of great Ron Smith / Dredd thrills that are so central to the whole history. Thanks, Anthony. That's fine work. Where you responsible for the recent FP anniversary photo floppy? RE: the anniversary floppy - I'd left the marketing department by then, but chipped in some contributions. All of the archive was literally lying in boxes gathering dust when I started in June 2016. I knew the anniversary was coming up and knew how great some of these images were. Only a fraction had ever seen the light of day. Those that had were usually yellowed, and low res. Archiving had been attempted before but with such a sizeable collection of assets, it was deemed too time consuming. I only got away with it as I scanned things in on my lunch breaks for a whole year, cleaning up what I could with my (fairly limited) photoshop skills. The results made it worthwhile! We have photos of Alan Moore signing Watchmen, Desmond Llewelyn's final public appearance (days before his death) and - of course - images from around 100 2000AD signings. All scanned at 300dpi or better! I'll be forever grateful to Ron Smith, like Carlos he played a role in a happy childhood by firing my imagination. I think the Black Plague showed in microcosm, what he did for Mega City One over many years. In just a few pages he brought the small town of Atom Gultch and its inhabitants to life, with such wondrous detail and individual expression of its mutant people. it blew my away at the time. Pirates of the Black Atlantic did later. Such detail, such incredible design work (yes I'll say it again, Ron's work is filled with it) it was a joy to read. So many more to mention, Sob Story, the Graveyard Shift, Blood of Satanus, Chopper, the list could go on. Special mention to the Daily Dredd's though which made me buy the Daily Star with my pocket money for many a year. Thanks for everything Ron Smith RIP. That was totally to do with the ludicrously zany artwork of Ron Smith. I've been a huge fan of the Daily Dredds ever since and I'm never far away from a reprint. Between the Black Plague, Bob & Carol & Ted & Ringo, Dredd Angel, the Judge Child and a few other key stories, for me the Cursed Earth was really cemented by Ron's style.